After a nearly 5-billion-mile journey that took more than six years, a NASA probe is finally ready to make history tonight (March 17) and become the first spacecraft ever to enter into orbit around the planet Mercury. At 8:45 p.m. EDT (0045 GMT Friday), NASA's Messenger spacecraft will fire its main thruster for about 15 minutes in what scientists call an orbital insertion burn. If all goes well, the maneuver should slow the probe down enough for it to be caught by Mercury's gravity and enter orbit. At that point, the wandering phase of Messenger's existence will be over, and its real Mercury-gazing mission will begin. "These will be the first observations made by any spacecraft from orbit around a planet that is one of our nearest neighbors," said Messenger principal investigator Sean Solomon, of the Carnegie Institution of Washington. The $446 million Messenger (short for MErcury Surface, Space ENvironment, GEochemistry and Ranging) spacecraft launched in August 2004. Over the past 6 1/2 years, the probe has been on an epic journey, completing 15 orbits of the sun and logging about 4.9 billion miles (7.9 billion kilometers), researchers said. During the course of its travels, Messenger has already made one flyby of Earth, two flybys of Venus and three flybys of Mercury. The main purpose of these close encounters was to bleed enough speed off the probe to prepare it for tonight's orbital insertion. But those flybys have had science benefits as well. Messenger's observations were the first new views of Mercury since NASA's Mariner 10 probe flew by the planet in 1974 and 1975, researchers said. But these were just practice runs compared to the observations Messenger should be making soon, researchers said. "The flybys have been wonderful, but they're really dress rehearsals," Solomon said. If all goes according to plan, Messenger should drop into a highly elliptical, 12-hour orbit of Mercury. The path will bring the spacecraft within 124 miles (200 km) at times, and take it out to more than 9,300 miles (15,000 km) away at others. The mission team should know by about 10 p.m. EDT tonight (0200 GMT Friday) if the orbital insertion maneuver worked. Scientists will then perform some checks and maintenance, and Messenger will begin its main science mission on April 4, researchers said. Using a suite of seven science instruments, Messenger will peer at Mercury in unprecedented detail for the next 12 months, mapping its surface and studying its composition and tenuous atmosphere. 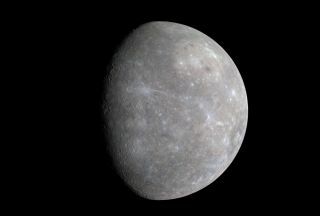 For example, researchers want to know whether Mercury harbors water ice in permanently shadowed craters at its poles. And they hope to learn enough about the planet's composition to figure out why it's so much denser than Venus, Mars and Earth — the solar system's other rocky planets. Mission scientists also want to better understand Mercury's geologic history, its core, its magnetic field and the thin, wispy "exosphere" of gases that blanket the planet. They hope that learning more about Mercury will yield insight into how the solar system formed and evolved, researchers said. After a long journey, Messenger is finally ready to go where no probe has gone before. And mission scientists are ready, too. "We're definitely excited," said Messenger mission operations manager Andy Calloway, of the APL. "We're ready to go, and we're looking forward to it." A webcast of NASA's Messenger arrival at Mercury will be provided by APL and will begin at 7:55 p.m. EDT (2355 GMT). You can watch the webcast by clicking here.